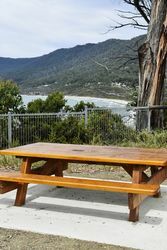 A number of tables and seats commemorates the thirty eight local men who served in World War One, and the Centenary of ANZAC landings at Gallpoli in April 1915 during World War One. 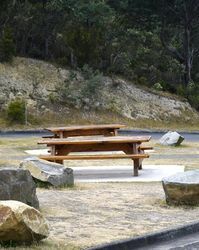 This memorial consists of a table and seats situated at Eaglehawk Neck (-42.997099, 147.934092). 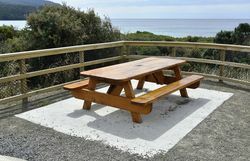 Two at the top Lookout over Pirates Bay, two at the Tessellated Pavement Car park at the Lufra Hotel (-43.010090, 147.929691), one at the Officers' Quarters Museum Car Park (-43.013722, 147.926032 ) and two at the Blow Hole Road Lookout Carpark overlooking Pirates Bay (-43.019504, 147.925357). 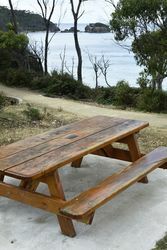 All the table and seat combinations have the same brass plaque. 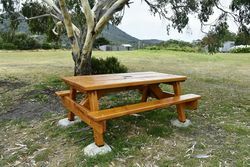 This table was constructed using timber from Monterey cypress tress planted at Port Arthur, in memory of thirty eight local men who served in the First World War. Seventeen of those men paid the supreme sacrifice. It is now a lasting tribute to all those who gave their lives for peace and freedom, marking the centenary of the ANZAC landing at Gallipoli 25th April 1915.